The One-Room Schoolhouse That's A Model For The World : NPR Ed Escuela Nueva (New School) isn't really new. But it is being praised as a kind of cutting-edge model that can teach the skills needed for jobs that robots can't do. At a one-room school in the Colombian Andes, students learn convivencia -- which means, more or less, the art of living together. Nine-thousand feet up in the Colombian Andes, in the province of Boyacá, a little orange schoolhouse sits on a hillside dotted with flowers. Thirty-three students, ages 4 through 11, walk as much as an hour to get here from their families' farms. The students greet reporters in English — "Welcome! Welcome!" — and Spanish, with a song and a series of performances. In one, an 8-year-old in a green school uniform and a colorful feather mask recites a folk tale about a terrible, tobacco-smoking monster called a Mohan. It's a charming presentation, but it's more than that. She's also building confidence, practicing performance skills and learning how to share a stage with others. It sort of feels like we've traveled back in time. But we're here because this school, and the international movement it's part of, called Escuela Nueva, just might be a global model for the future. We've ridden up here with Clara Victoria Colbert, known to everyone as Vicky, who founded Escuela Nueva in the mid-1970s. She set out to take progressive, democratic education theories — cooperation, self-paced learning, arts-focused education — and apply them to some of the poorest, least-resourced schools in the world. 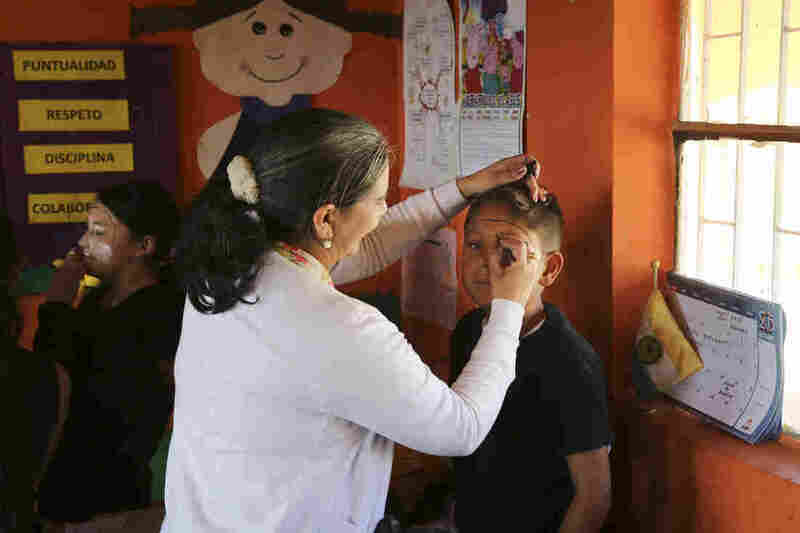 Teacher Maria Isabel Camango Guido paints mime makeup on one of her students for a performance. Since the early 1980s, Colbert says she has reached some 5 million kids. Yet this "bottom-up innovation," as she calls it, remains relatively obscure in the U.S. 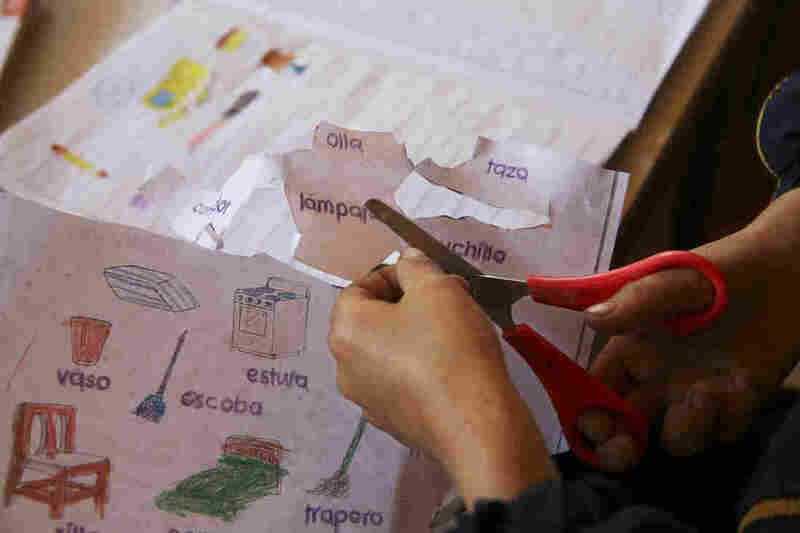 The backbone of Escuela Nueva is called the Learning Guide — what Colbert calls "a combination of a textbook, workbook and a guide for the teacher." A learning guide looks something like a comic book. There's a different one for each grade. Reading, writing, math, science and social studies concepts are combined in each lesson. It's a simplified version of project-based learning. Each lesson page has an illustrated story, open-ended questions, practice problems and both an in-class and a take-home activity. This allows the students to pretty much go at their own pace — a low-tech, paper-and-pencil version of that current-day buzzword, "personalization." A student cuts out vocabulary words and pictures for a project. At Escuela Rosal, the children sit around tables: a tiny one for the 4-year-olds, up to the tallest one for the 10-year-olds. Each has a notebook open alongside the learning guide. At one point, the littlest kids were cutting out pictures from a worksheet — a hen, a shoe — and matching them together with the right words. Meanwhile, the third-graders were using measuring tapes to measure and cut sheets of newspaper with a given area, and the big kids were coloring in fractions on squares of graph paper. When they finish their own lessons, the understanding is that they will help each other, and the younger kids, before moving on. The learning guides enforce a highly standardized curriculum. On the other hand, a benefit of that highly structured format is that it can be put into practice quickly, with teachers who have have less formal training. It's so flexible, in fact, that among Colbert's early allies in implementing this model were the country's coffee farmers: Their children could leave school for harvest season, come back, and pick up right where they left off. But that's not the only special feature of the learning guides. 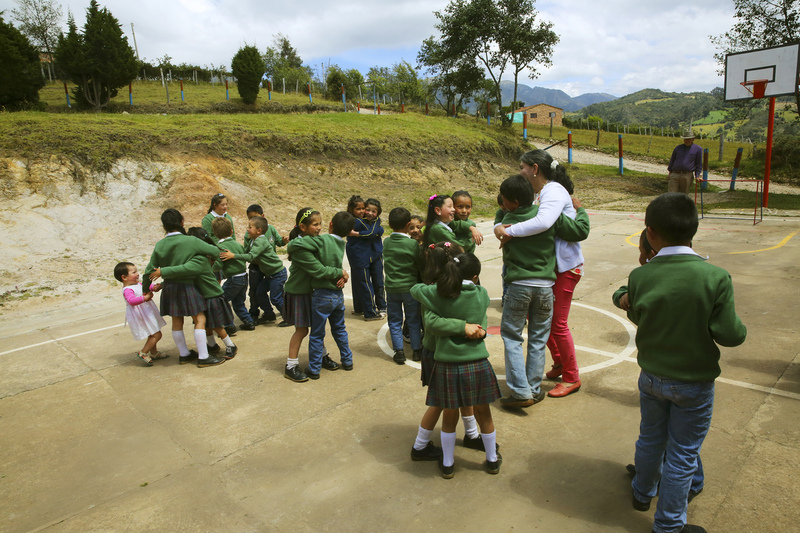 In Escuela Nueva, homework is designed to promote other social goals. It can even save lives. Many of the take-home activities reinforce what Colbert calls "child survival behaviors." These include vaccination, nutrition, food safety and how to distinguish between colds and a serious respiratory infection. For example, the guides might instruct a child to go home and check that her baby sister has had all her shots, or go with her father to inspect the water cistern to see that it's covered to keep out insects. Colbert says lessons like these combine school learning with common sense, real-world applications. "Instead of learning 'Which is the longest river of Egypt?' " she explains, "It's, 'How can I help my siblings not die of diarrhea?' "
Colbert credits this instinct for practicality to her background. She's the daughter of a Colombian teacher who led teachers' colleges, and a U.S. Navy officer. She studied sociology at Stanford before returning to her home country. "Sociologists always want to introduce social change, and beat the system some way," she says. "I realized there were only two ways to really improve things significantly. You make a social revolution or you make a silent revolution, which is education." In 1970s Colombia, revolution was far from an abstraction. M-19, the rebel guerrilla movement, formed in 1974; the famous Medellín drug cartel, in 1976. The violence went on for decades. 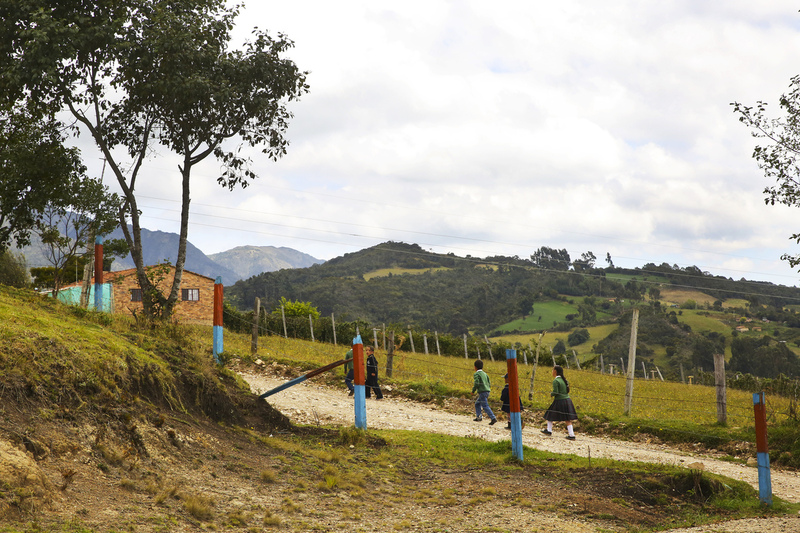 Escuela Rosal sits on a hillside 9,000 feet up in the mountains. It has 33 students, ages 4 through 11, many of whom walk up to an hour to get here from their families' farms. Colbert was undaunted. She took a job in the education ministry, seeing schools as a lever to transform the country. "I was totally aware that if we don't have quality basic education, nothing will be achieved in any country in the world," she recalls. "You won't have social development, economic development, peace, democracy. It's the only way." At the time, children in the Colombian countryside typically attended one-room schoolhouses, with compulsory education only until third grade. There was a severe shortage of teachers, most of whom taught by rote and relied on corporal punishment. Freddy Tipazoca, a father we met at Escuela Rosal, told us that his teachers "educated us with the rosebushes." Soon after returning home, Colbert met a teacher named Oscar Mogollón, the head of a demonstration school in the city of Pamplona. He was working with international advisers to do what seemed almost impossible: allow every student in a multi-grade classroom to work at his or her own pace. And at the same time, to incorporate hands-on activities and practical applications of abstract concepts. All the while building citizenship, democratic ideals, and cooperation. The ideas were inspired by the developmental theories of Jean Piaget and the progressive educational methods of Maria Montessori, Reggio Emilia and John Dewey. In 1976, Mogollón and Colbert teamed up to scale the system. They had to teach it to teachers who themselves had little formal education. 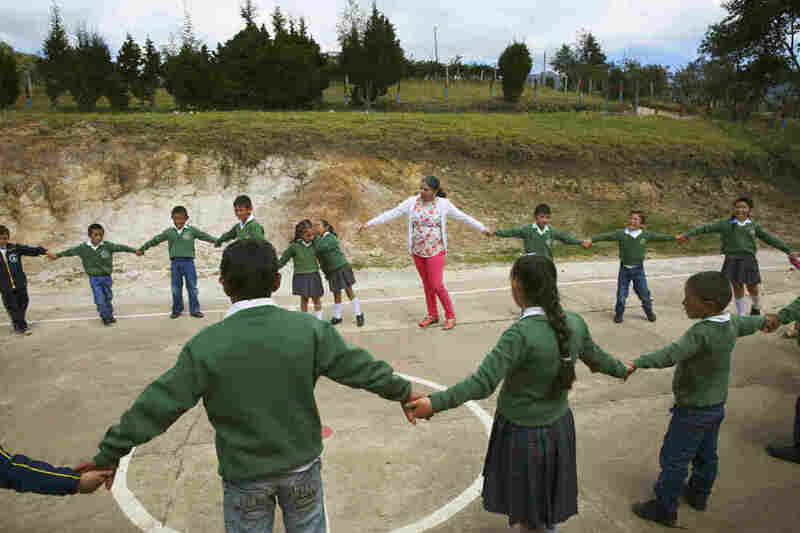 And it had to be affordable: Currently, Escuela Nueva costs about $30 per student per year over and above Colombia's average annual spending of about $2,000 per elementary school student per year. The low-cost, practical instructional innovations are a key part of the Escuela Nueva model. But on our visit to Escuela Rosal and a second school, Colegio Gimnasio Santander, we noticed something equally important: joy, engagement and warmth. The mountainside schoolhouse is packed with the arts, Reggio Emilia-style. Besides the folktale recitation, we're treated to a mime performance, a puppet show and several songs. 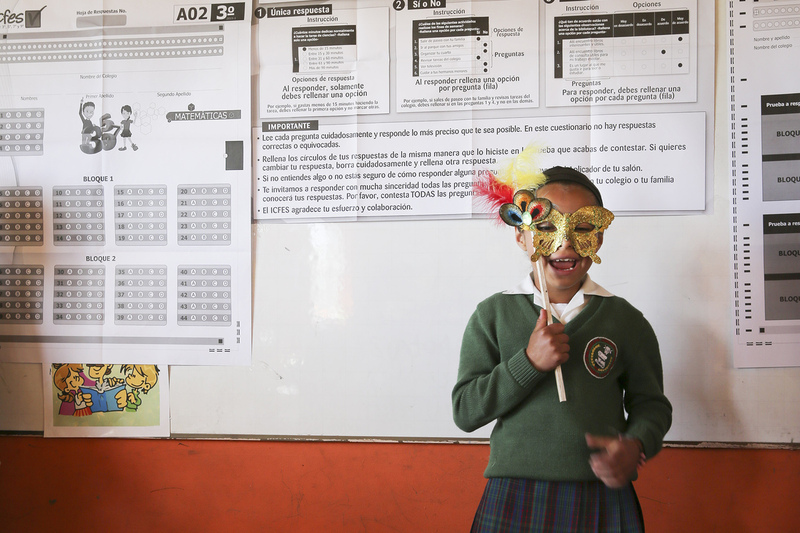 A young girl recites a local folktale as part of Escuela Nueva's Montessori-style curriculum. Just off the main classroom, there's a storage room crammed with art supplies and projects the kids have made. One shelf has a row of little clay sculptures based on the game Angry Birds. The classroom walls are covered with the students' posters, and mobiles of the solar system dangle from the ceiling. Colbert was convinced of the importance of this from the beginning: "Children need blocks, colors, active learning." Social and emotional learning, another present-day buzzword, is very much in evidence here. The school's cooperative model places a huge emphasis on democratic values: Nearly every child has been elected to some position or committee, with responsibilities like cleaning up and picking the sport at recess. The first students who greeted us, formally shaking hands, were the fifth-grade president and secretary. There's an active PTA too. Parents take turns cleaning and maintaining the grounds, even cooking lunch. Maria Isabel Camango Guido has been the teacher at Escuela Rosal for 10 years. "I love everything about this method," she tells us in Spanish. "It's not like I can teach them the concept of kindness; we are living it." One word they use a lot in Escuela Nueva is "convivencia" — it means, more or less, the art of living together. On the classroom wall, there's a board where students leave notes of friendship and gentle encouragement for each other. Teacher Maria Isabel Camango Guido instructs a group of students. Concepts from different subjects are combined in each lesson, into a simplified version of project-based learning. A girl named Laura writes, in Spanish: Dear Natalie, I love you because you are my best friend and you play with me. I hope that you take a good shower ... and hopefully you can have better handwriting. Thank you for everything. The emphasis on kindness extends to strangers. When it's time for us to leave, each student hugs every one of the visitors. Some experts believe that this school, designed for poor, rural students, could become a model for the future, even in rich countries. One of those experts is Rebecca Winthrop. She directs the Center for Universal Education at the Brookings Institution. She calls Escuela Nueva "a very good model for the new way of schooling," because of the emphasis on community, teamwork, social impact, creativity, self-directed learning, and student leadership. When Winthrop talks about the new way of schooling, she means something specific. Her team has been engaged with all the world's countries in setting a new global agenda for education, through the U.N.'s Sustainable Development Goals project. It's like a big to-do list for the planet. The Millennium Development Goals, from 2000 to 2015, included universal primary education. Enrollment grew by 7 percentage points — tens of millions of children around the world. The Sustainable Development Goals, adopted last fall, broaden the agenda to focus on a "breadth of learning opportunities," or what is sometimes called 21st century skills. Recently, two international reports have been released that pose a "breadth of skills" as one important answer to major social and economic challenges. "Two billion jobs (half of the world's jobs) are at risk of disappearing over the coming decades," says Winthrop. "And if we continue with business as usual, by 2030 800 million young people (half of our youth generation) will not have the skills they need for adult life... we need education that will equip children not only with the basics but a range of skills to be prepared for this future world." And what are these skills? 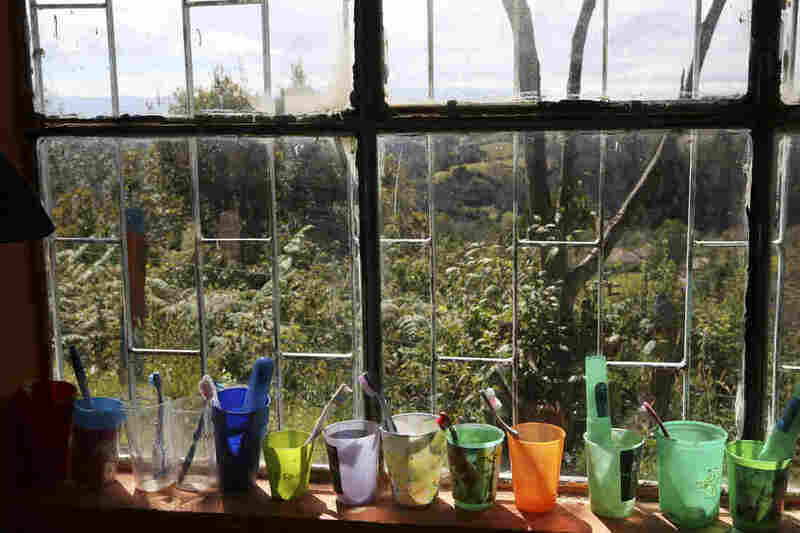 Students' toothbrushes and cups sit on a windowsill. "In life, people have many paths," Winthrop says. "But you want them to have agency to be able to act and fully develop what they want to do. They need self-confidence, to be able to negotiate, form good relationships, be a constructive member of a community." Over time, Vicky Colbert has had to wear many different hats while pursuing her vision. Through the end of the 1980s, she worked inside the Colombian ministry of education. Then, the entire government was reorganized. Schools went to local control, and many dropped the model. So she went to work for the United Nations, taking Escuela Nueva international. Eventually, it spread to 17 Latin American countries. The variation in how the model has been put into practice makes it hard to track results. But in general, Escuela Nueva schools have better attendance than conventional rural schools, and there is less repeating of grades, better behavior and higher achievement scores. Recess games are often played as a group and focus on kindness and cooperation. "It's not like I can teach them the concept of kindness," Guido says. "We are living it." A UNESCO report from the 1990s looked at schools across Latin America and found Colombia was the only country, aside from Cuba, where poor rural schools were doing a better job than better-resourced city schools. They credited this to the Escuela Nueva advantage. More recently, Colbert has started an independent nonprofit, Fundacion Escuela Nueva — Volvamos a la Gente (Returning to the People). They are tracking increases in behaviors like cooperation among students at Escuela Nueva schools. They're also updating the model to work in cities, where the global population is increasingly shifting. We visited one in Boyacá's capital city, Tunja. The school there was actually a low-cost private school rather than a public school. They charged tuition, had kids separated by grade level, and went all the way up through high school. Many students were using handheld tablet computers. But the fundamentals of the model, from the learning guides to student committees, were all there. Colbert wants to partner with other nonprofits and even private companies. They've opened in places like Zambia and Vietnam, and are eyeing the U.K. and the U.S.
"It's like the story of Cinderella," she says. "You start with the poorest of the poor, and then at the end you say, 'Oh, my God, this is cutting-edge pedagogy!' Everybody is talking about it!"